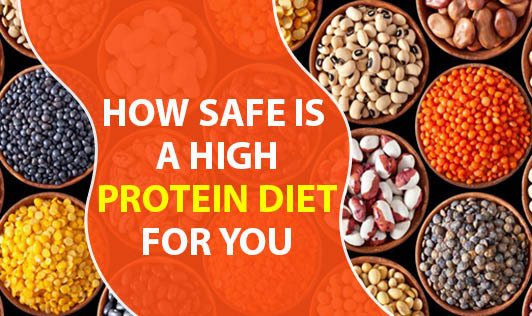 How safe is a high protein diet for you..
High protein diets are extensively being used by people for body building and weight loss. These diets come with several health problems that may affect you later in life. Many people start taking protein supplements when they begin an exercise regime, irrespective of the type and duration of the exercise. Many studies suggest that, to build muscles, proper high intensity strength training and adequate rest between sessions is required more than high protein intake. Muscle growth is stimulated by the kind of exercise you do. Most of the high protein diets are low in carbohydrates and high in saturated fats (which come from animal sources). A diet low in carbohydrates will have different effects on your body. Carbohydrates are needed basically to provide energy for the day to day activities, so if the intake of carbohydrates is low, your body will start using the muscle protein to get the required amount of energy. So, to spare the protein for muscle growth, you need to have adequate carbohydrates in your daily diet. The high fat content of these diets will increase the risk of heart disease, liver diseases, and also stroke. If continued for a long time, the high protein intake will strain the kidneys, as the function of the kidneys is to eliminate the byproducts of protein metabolism. Some studies also say that, excess protein intake can lead to osteoporosis. There can be similar effects with protein supplements. One can get good quality proteins in the required amount by consuming the right foods in the natural form. So, if you want to follow a high protein diet, even if for a short time, consult a Dietitian, who will help you lose weight or increase the muscle mass in a healthy way. Do not get carried away by any kind of fad diets. Remember that treating the side effects is more difficult than achieving good health!